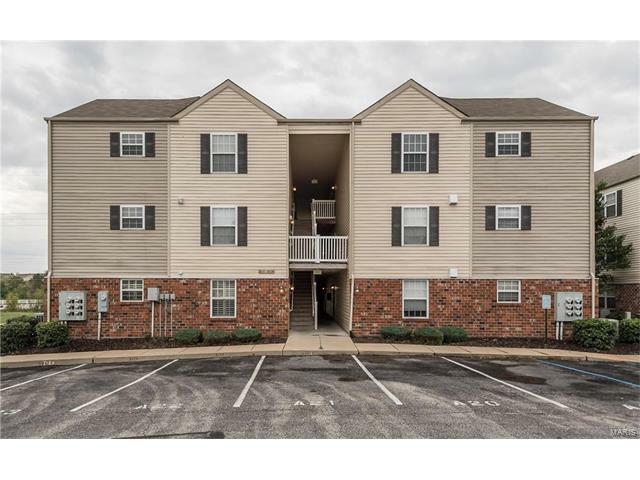 This top floor 2bd/2ba Condo is in a great location adjacent to Hawkridge Lakeside City Park! Spacious with vaulted ceilings & the split bedroom plan offers great privacy! Master bedroom with large walk-in closet and full bathroom. Large foyer with private laundry room & full guest bath. Gleaming hardwood floors in the foyer, living room and kitchen! The kitchen offers 42 inch cabinets, black appliances and an organizational desk. Plenty of natural lighting throughout! Storage closet off of the private balcony and unit comes with 1 reserved parking spot. Monthly fees $150 include water, trash, snow removal, grass & exterior maintenance. FHA Approved..Why RENT when you can own this unit to call HOME!! HWY 40 to 4A-N exit, head west of 40 to right onto Welsh Drive. 3rd floor unit.